SummaryViacom continues to trade at yearly lows despite results that grew over last year. The company maintains the large stock buyback plan that will benefit the stock more after the recent declines. The current 15% Net Payout Yield is a strong buy signal. The stock of Viacom (NASDAQ:VIA) (NASDAQ:VIAB) remains in a major downtrend despite the massive stock buyback program of the company. The latest quarterly results are a prime example of the situation with the entertainment company beating analyst estimates while the stock sits at recent lows. Viacom even trades at a generally attractive valuation though the market doesn't seem to want the stock. Disclosure: Long VIAB. Please review the disclaimer page for more details. SummaryAT&T reports Q4'14 earnings. Investors should continue avoiding the stock. The original investment thesis remains intact with margins under extreme pressure. The quarterly results of AT&T (NYSE:T) were only in line with the already reduced expectation of analysts. The giant domestic wireless provider produced record smartphone gross adds and upgrades while watching margins plunge. The net effect remains a stock that is likely to continue churning in the low $30s range while investors collect a solid 5.7% dividend yield and wait for the impact of the wireless auction. 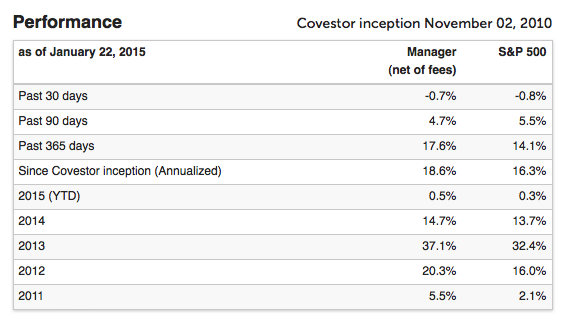 The Net Payout Yields model on Covestor has now beaten the benchmark S&P 500 for all 4 years on the investing platform. In addition, the model is slightly ahead starting the 5th year and it's exceeded the benchmark by at least one percentage point each of those 4 years. Most importantly though for investors looking for a conservative portfolio to grow retirement funds or reduce total risk, the model has a beta of only 0.90. This means the concept is less volatile and risky than owning the S&P 500 index directly. In addition, Covestor calculates several other ratios to highlight the benefits and reduced risk of the model for any interested investors. Please click on the link to invest directly via the online Covestor platform. SummaryGoldman Sachs reported Q4'14 earnings. The stock remains a Strong Buy. The original investment theory of solid yields and huge earnings remains intact. After the weak bank earnings this week, investors didn't expect much from Goldman Sachs (NYSE:GS) by the time it reported Friday morning. The bank actually beat estimates, though analysts greatly reduced these estimates from levels of a week ago. Even after the sell off this week, the stock is struggling to gain traction with it trading down around $2.00 mid-day. Again, investors appear more concerned about momentum instead of the valuation proposition of the financial institution. SummaryDISH Network begins offering limited pay-TV services online. The satellite TV operator has a first mover advantage, but the service doesn't appear to offer anything proprietary that couldn't be replicated or enhanced. Content providers with the best content will benefit the most from these scaled-down online packages that feature only top channels such as ESPN and TNT. DISH Network (NASDAQ:DISH) made the interesting announcement last week that it is joining the over-the-top revolution for pay-TV services. The company follows recent announcements by Time Warner's (NYSE:TWX) HBO and CBS (NYSE:CBS) to offer subscription services online to compete with Netflix (NASDAQ:NFLX) due to the increasing amount of consumers that are cutting the cord.